Mike Strickland is joined by virtuoso bassist, Clipper Anderson to create an exciting mix of popular, jazz, blues and original music. Clipper’s vocals remind you of Tony Bennett, Frank Sinatra and Bobby Darrin. Mike and Clipper have a special synergy having performed and recorded together for the last 20 years. Clipper is truly a one-of-a-kind musician who has a total command of his instrument. Combined with Mike’s arranging and producing skills, this duo is a tour de force of art and musicianship. 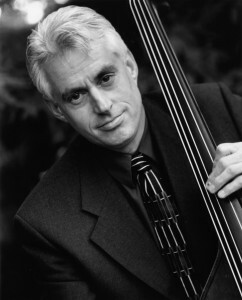 Known for his improvisational virtuosity, his steady presence in the pocket and his command of multiple styles, bassist Clipper Anderson is one of the most highly regarded musicians on the Northwest jazz scene today. Equally comfortable with straight-ahead, traditional, free jazz or bebop, he plays with genuine reverence for the music and an unassuming mastery that speaks for itself. Clipper has enjoyed a long and distinguished career as a composer, performer, studio musician, vocalist and educator. He has shared the bandstand with a long list of jazz luminaries including Michael Brecker, Arturo Sandoval, Dave Samuels, Peter Erskine, Bruce Forman, Tamir Hendelman, Bob Mintzer, Lew Soloff, Bucky Pizzarelli, Benny Golson, Paquito D’Rivera, Phil Woods and Buddy DeFranco. As a session musician, Clipper has appeared on numerous recordings, including five with Northwest vocal icon Greta Matassa.